I’m a melting wax figure. Walking to class, you might mistake me for one of Madame Tussaud’s wax figures that sat in the sun for hours (preferably Britney Spears or Kim Kardashian). Don’t get me wrong, I love summer. The concept of shorts seems more desirable when you’re not obligated to wear them to survive. A year ago, I debated going to school in the South. Looking back now, I cannot imagine myself surviving the intense humidity, blazing sun and year-round bikini season. For those of you that attend school down South, I praise you. Don’t let the intense sun overwhelm you though, you can find ways to survive the heat. 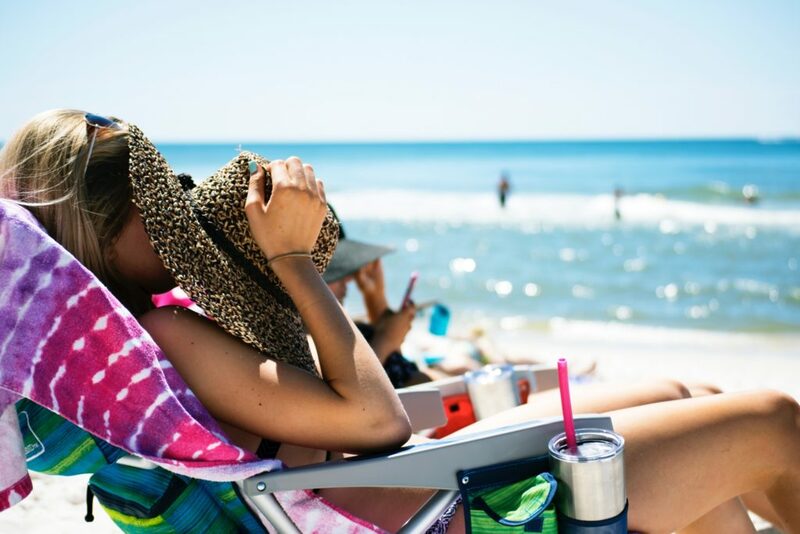 Enjoy the sun and the sand after you solve your summer hassles with this list. We accept the logic that less clothes means less sweating which equates to less problems, but we forget to acknowledge the reality of air conditioning. Then we must decide to dress for the scorching heat outside or the Arctic AC tundra inside any building. So despite the scorching hot temperatures, you definitely need a cute, light summertime cardigan. As a kid, carrying around an oscillating fan attached to a water spritzer kept me cool. Nowadays, I don’t think keeping cool like that would be too cool. I suggest you save your reputation and invest in a sweatshirt pronto. It may not look cool wrapped around your waist all day, but at least you’ll avoid getting goosebumps or worse—nippleitis. For those whose bodies weren’t built for tank tops and short shorts, join the club. I have dancer thighs, which means I do not have a thigh gap (boohoo, someone cry me a river). Chafing is a real thing, leaving many girls stuck between the choice to live at feverish temperatures all day in protective clothing or cool down in a pair of shorts and endure the wrath of skin friction. Despite Amy Schumer’s attempts to normalize putting deodorant on her inner-thighs, lotion seems like a more common option for girls to solve their chub rub problems. Jessica Rogers, a sophomore at University of Florida, experiences chafing all too often. “Going to a school in the South, I’m required to be in a bathing suit year round.” With thighs not entirely conducive to bikini bottoms, Rogers found lotion to act as her method of protection from the painful rubbing. Rogers also suggests using Aquaphor Advanced Gel because it protects against the friction in her legs and allows them to smoothly glide against one another. What a beautiful solution to a horrifying problem. With shorts comes shaving. At least in cold weather, your legs can hide under leggings or jeans. Now in the summer, there’s no hiding those tarantula-like beasts. Either show the world your inner werewolf or invest in some Gillette Turbo Razors—I suggest the latter. While I lucked out with minimal amounts of blonde body hair, not all got so lucky. When the time comes to hide all traces of this natural bodily process, I turn to Nair. Nair is a lotion that you apply to your skin, leave on for four or five minutes and then wash off in the shower along with your unwanted hair. Disclaimer: It smells horrible, but it does get the job done. The smell might nauseate you, but then it transforms your legs into glowing, glistening and hair-free spectacles ready to show off. No one wants to look pale during the summer. Unfortunately, I’m convinced I have extreme melanin deficiency because the chances of me turning into a lobster are significantly higher than getting a tan. With the sun so kindly beating down on me too many hours of the day, my freckle count reaches at an all-time high. Carly Taylor, freshman journalism major at the University of Maryland, applies sunscreen every time she goes out in the sun. Taylor embraces her freckles, but she certainly doesn’t look forward to the inevitable sunburns that summer brings. “I’m a huge fan of Neutrogena stuff, especially their facial sunscreen.” Taylor loved the lightweight feel of it and the way it allowed her to avoid looking permanently flushed. Since she started using Neutrogena’s spray sunscreen, Taylor has enjoyed that oh-so-desired bronzed glow, without burning to a crisp. …or because you’re wearing a skin-tight T-shirt that’s hugging you in all the right and wrong places. Black is the new black, but not when it’s 90 degrees outside. Light colors may come in handy in the summer but they’re definitely not enough to keep your body from sweating like an Olympic athlete. Suddenly, that white shirt resembles one of those wet T-shirt contests in the movies. Deodorant is no longer an option but a requirement. Your best bet? A men’s deodorant since those are often stronger than your typical Lady Speed Stick. Old Spice brands provide an array of delicious man scents that will keep you dry and fresh all day. I’m a fan of their “Fiji” option. Nothing says “summer” like tropical-smelling armpits, am I right? Try keeping up with your usual makeup routine in the summer, I dare you. Unless you plan to stay perched in front of a fan all day, good luck looking like anything other than a drunk girl that just dropped her iPhone in the toilet. And wearing sunglasses? Forget about it. With the amount of sweat excreting from your body, your nose looks more like a Slip ’N Slide than a sturdy spot for them to stay in place. The summer season calls for a new set of products to keep you easy-breezy and selfie-ready. Luckily, the makeup gods invented primer and oil-reducing powders and pads to keep your face fresh and sweat-free. I’m a fan of Neutrogena’s Shine Control Powder but do need new tips to keep my face looking extra flawless during the disgustingly hot summer. Yuliya Tsishchanka, a freshman at San Diego State University, has perfected the art of flawless makeup that lasts all day. “For flawless skin in the summer, always start off with a primer infused with SPF in order to achieve long-lasting make-up and protected skin.” Tsischanka suggested avoiding liquid foundation because most tend to smudge and come off in the heat. In terms of eye shadow, she suggested cream eye shadow sticks. “A great brand is Bobbi Brown, stays on all day!” She also suggested using waterproof products, especially mascara. Less is more during the summer since you’ll look naturally sun-kissed under the rays anyways. If your hair doesn’t resemble Mufasa’s lion mane on a hot, summer day, you’re wrong. Virtually no one’s hair naturally glistens and glows in the summer sun without some form of help, be it a product or a wig. In the summer, every day becomes a hat day and going outside with wet hair invites disaster. Luckily, I’ve learned the tricks of the trade to stop my hair from appearing like it just survived a nuclear explosion. Besides a straightening iron, I like to use Keratin shampoo and conditioner. It takes the frizz out just enough to convince my hair it is beautifully straight. Also, the hair gods gave us the miracle worker known as dry shampoo, an oil-absorbing powder in an aerosol can. Spray it on your roots after a long day and your luscious locks will return in seconds. Ditching the can for an old school bottle of baby powder works just as well too. After years of suffering from an involuntary afro, dry shampoo and powder have proven to be my go-to solutions. I live to tell the tale so hopefully, that speaks volume(s)—no pun intended. Beware bad tan lines and find out what students do to avoid them (or not). Once the clouds roll away and the last of the textbooks are sold back to the campus bookstore, students flock to lounge chairs like seagulls to a dropped Dorito. After months of sitting in stuffy classrooms, it is only natural to crave the outdoors and a kiss from the summer sun. Many people, however, get caught up in the allure of the fresh air and innocently forget to apply any form of sunscreen. Enter the inevitable and oh-so unattractive tan line. The perfect bathing suit, coconut tanning oil and the highest UV index are all ingredients for the perfect summer tan, but more often than not, something will go awry leading to a tan that looks like it’s straight out of a geometry book. If you know you are going to be out in the sun, it is essential to apply some form of protection from the sun. Aside from decreasing skin cancer risks, utilizing sunscreen is the easiest way to avoid awkward burns. This is particularly important when you may not be able to wear a bathing suit; no one, and I mean no one, wants to live through the repercussions of the dreaded farmers tan. Although opinions vary, guys tend to put a little less emphasis on acquiring the perfect tan. Perhaps this is because it’s almost impossible to acquire an awkward tan from a pair of board shorts, but nevertheless, tan lines tend to be the furthest thought from their minds. Coming from someone who has dedicated way too much time to rubbing aloe in the most awkward of places, take the extra minute to apply sunscreen, or be confident in the possible shapes that may ensue.